As I mentioned previously, we have befriended a white long haired cat that appeared in our neighborhood. It is very suspicious of people, seems to be pretty deaf (as is common with white cats with blue eyes) and gets in lots of fights with other cats that roam the neighborhood. 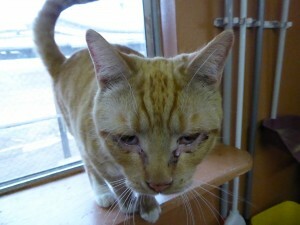 In other words, he is a raggedy mess and we feel very sorry for him. 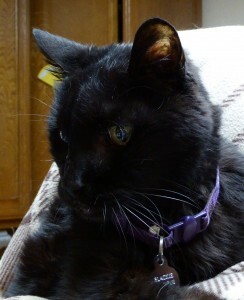 I am using “him” for the moment, as that is how we refer to this cat. Who knows, it may be a her. 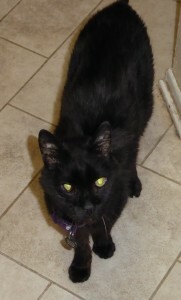 To make things a bit easier, we call him “Cloud.” That is shorter than “That white cat.” Cloud is kindly eating up the Science Diet canned cat food I got for a rip roaring good deal at Pet Smart, that my cats absolutely refuse to eat. Even the young ones will reject it for the dry food every time. Folks, this stuff was 37 cents a can and I bought LOTS of it. They were changing their labels, it wasn’t like it was on sale because it was several bad flavors. I guess when you are living life on the mean streets, you aren’t as picky. Cloud is very wary of people. 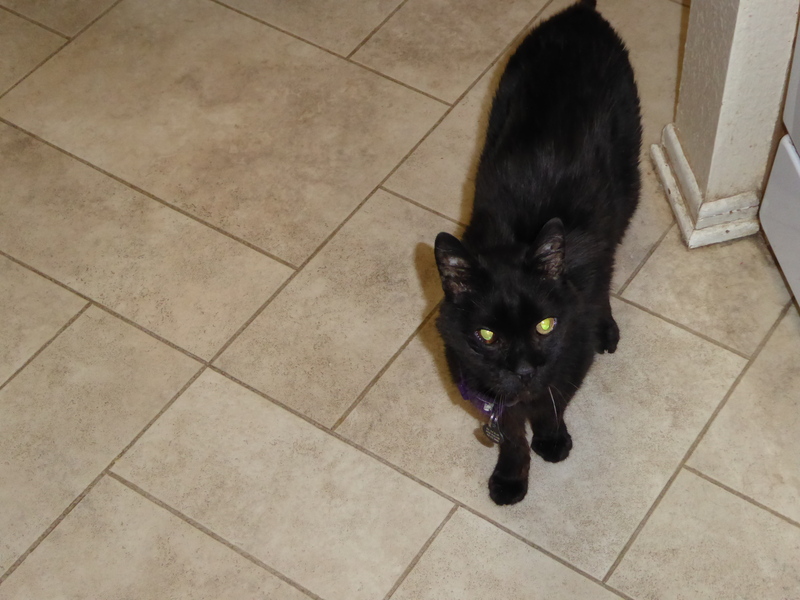 When I fed him the first time he waited until I was completely out of sight before he would come investigate. I can’t see how a cat with a high percentage of Persian in him could be a compete feral, but it is obvious that life has been hard for him. However, I don’t want to leave food out for him randomly due to the wildlife and other cats we have in the neighborhood. I have no interest in becoming a magnet for all cats nor do I want my place to be the snack bar for all manner of rodents, skunks, raccoons and coyotes. So, I made a deal with Cloud. I see him, I feed him. No see, no food. I am pleased to report that he is getting the hang of this concept. However, it does result in what I call the “Cloud Dance” at times. The front door to our house is actually on the side of the house and to get from there to the driveway you have to go about 10 feet to the front yard and then veer left on a walkway across the front yard. Cloud’s bowls are at the corner of the house, If all I am doing is going out to get the newspaper, which Hubby has kindly thrown up by the front door, and I see Cloud, I just grab some food, put it in his bowl while he waits warily what he considers a safe distance away, and all is good. It gets a little complected, however, if I see him while I am coming or going. If I am leaving the house and I happen to see him, I can go back in and get some food for him. But, as I try to get to my car he inevitably sprints ahead of me, away from the food I put out for him, and near and nearer to the car I want to drive away in. So I have to put the food down, start towards Cloud (who is between me and my car at this point), which makes him sprint a little ways away, then I cross the planter, circle around the orange tree, and cross the grass to get to my car. That way he doesn’t go any farther and end up under my car. The other day I did the Cloud dance, but from the opposite direction. I came home, and he was curled up under the lemon tree, his favorite spot. So I went in with my groceries, and came back out for the second load. But, as usual, Cloud had gotten up and was sitting by his dish. In order to get my groceries, I would end up driving him across the yard again. So, I went back in, got some food and gave it to him, then went through my house, out through the garage, though the side gate, and into my driveway to get my groceries. All to avoid disturbing a stray cat while he was eating. Oh well, at least I get more steps in, doing the Cloud dance. The other night something funny happened. Remember, Cloud is a very dirty and ragged white Persian kind of cat. He of reminds me of a former Hollywood starlet who is now old and has seen better days.. Hubby and I came home after dark, and, as we turned into the driveway, the headlights highlighted Cloud, doing that funny sit up cats do that exposes their private areas and belly for all to see while they groom themselves. Cloud looked up with his amazing resting b**** face, and I felt like I had just accidentally stumbled into someone’s boudoir! I wanted to say, “Pardon me!” and curtsy! I am happy to report Cloud is less wary with us now. 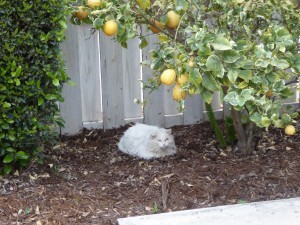 We can walk right by him while he is resting under the lemon tree and he won’t even get up, even though we are only a few feet away. He is still uninterested in our direct attention, but we give him food and I think that counts for a lot when you are living life on the streets. This is Cloud, hanging out in his favorite spot, where he waits for us to appear and give him food. I feel like I got something done today. I went with Eldest Daughter to get her drug test done for her new job substitute teaching. FYI, they don’t mess around when they plan on letting you near children! And I am a nice Mom to go along. We went to a thrift store that supports pet rescue and I bought something, I confess. I called our local water company to report a leak in the street near my house. I fixed a new recipe called Baked Spaghetti. Rumor has it it tastes delightful, but I haven’t had dinner yet. I cleaned up all the dishes, wiped down the counters, and ran the dishwasher. I cleaned my sink in the bathroom. I took care of cats, which is no small feat in my house anymore, especially since I added the front yard stray to the feeding rotation. He has quickly figured out that if we see him, we feed him. We tend to see him quite a bit most days. I called some friends about a meeting I attended last night and some plans for this weekend. I had a conversation with the general manager of the parks district to discuss some possible changes staff reports, minutes and such. Later tonight I have a parks district meeting. There was a Starbucks stop in there somewhere, and I made myself lunch. When our children were young, Hubby and I realized there was a certain type of knowledge, what you might call “cultural knowledge,” that was an important part of what a person should know to navigate life. Hubby and I thought it would be good for our children to understand these cultural references for two reasons. One,it just makes life more interesting to understand what people around you are saying and referring to. Second, we figured the girls were likely to run into these kinds of references in the work place (from old people like us) and it would serve them well to understand those references as well and not look like a dumb green kid. So, when we had the chance, we would expose our kids to things or explain certain references when they came up. Yes, we made them watch “Chariots of Fire.” They thought it was boring but they sure do recognize the slow run and song now! How do you explain Watergate in a few sentences? I tried, and with the help of other adults in the room I think we got the point across. Maybe a few kids in that room will remember what a “gate” reference means if they hear it in the future. If one of them actually looks up Nixon and Watergate I would be thrilled. According to the newspaper, we have had a year and a half’s worth of rain so far this season. The weather people say we are going to get slammed with more rain (and wind) tomorrow and Friday. Given the drought we have been having, that is great news. I haven’t had to turn on our sprinklers in weeks and weeks. We haven’t had to put a drop of water in the pool, either. The parks district I sit on the board of is saving thousands of dollars a week by not having to water. After salaries, water is our single most expensive budget category. Given that the “summer” lasted until the middle of November last year, all this rain is great news for the parks budget. But, inevitably, after the rain comes weeds. The hills are alive with green things popping up all over, and so is my yard. We have a bank at the back of our yard that we pretty much ignore. It has one large ground cover type of bush on it but it otherwise a lovely place to grow weeds. IT just hasn’t been a priority in terms of landscaping for us. But it isn’t easy on the old creaky joints to get up and down that bank, pull the weeds, get them back up the bank to the trash can, etc…but we do it. In the years that we have little rain, it is much easier. The up side of a drought! This year will be harder. Oh boy! I went out with my trusty weed holder. It is an 8 gallon or so collapsible green waste holder, or trashcan, that I find very handy. When I fill it up, I feel like I have made some progress, but it isn’t too heavy for me to carry and empty in the big green waste bin. Well, unless you fill it up with really healthy weeds, Then it is a bit heavy, as I found out, Definitely a two handed job, carrying it to to be emptied. And, unlike usual, I felt like my eight gallons of weeds barely made a dent in what we need to deal with. Sigh….. I talked to Hubby abut the bank and its healthy crop of weeds. I thought we needed to get on it right away, before they got any bigger. Or we needed to hire someone to get those things pulled. However, Hubby had a good point. We are still in line to get more rain. If we pull all the weeds, the areas of the bank that are not covered by the big bush will be subject to erosion. Sigh. Those things are going to be as tall as me when the rainy season is over this year. I had to have blood drawn and went to get that done this morning. Two different doctors decided they wanted to see something my blood could tell them, and so off I went. I figured out a long time ago that I am not the easiest person to get blood from. Not the hardest, but not the easiest. I told the young man whipping out the tubes and needles to use my left arm, as there was no point in trying my right. Believe me, after 55 years I have this figured out. Unfortunately, he tried on the left side and had no success. This was when I knew I had a newbie, and things would continue to go down hill from there. Sure enough, next he decided to try the right side. Sigh. Believe me, if you are unsuccessful on my left arm, you sure as heck won’t have any success on my right. But, what the heck, it is only needles, right? Well, no surprise, no success on the right. At that point, the more experienced person stepped in and was able to successfully fill three vials with the red stuff. Whew! At that point I made a beeline for the nearest Starbucks where I treated myself to a protein bistro box and a grande hot chai tea latte. The trauma of three pokes has not left me yet but I survived. Next time I am not going to let them go to my right arm. That is just a waste of time and needles. Gosh, I don’t enjoy airplane travel. I like how it gets me places quickly. I sometimes like talking to the people I am sitting next to. But there are other things I don’t like, like being trapped in a rather small seat, elbow to elbow with strangers, for hours on end. On my most recent trip, here are the good things I encountered. 1. On the first leg of my trip I was sitting on the aisle and the middle seat was taken by a gentleman who was trying to get moved to another seat. So, being the nosy person that I am, I kind of in a way sorta inquired as to why he was trying to abandon me there in row 26. Come to find out, he was a double amputee, and in order to be comfortable, he needed his prosthetics to be able to extend at a 45 degree angle and there was something about the middle seat that prevented him from doing that. The flight attendants were unable to accommodate him, so I insisted he trade seats with me. He was ever so grateful to be able to do that and I was rewarded with an interesting and educational discussion of prosthetics as well as some enjoyable chit chat about other things, that helped my two hour flight speed by. He explained that if he can’t extend his legs enough, the prosthetics digs into the back of his legs and cut off circulation, making for a painful situation. He also explained that his legs are made for walking, not standing, so he would rather walk for 20 minutes than stand for 20 any day. Who knew? 2. On the second leg of my trip I sat next to a woman who is in distribution at Nike. She was telling me that most major companies that have a significant online presence have a major distribution warehouse in Memphis, because that is the headquarters and hub for Federal Express. She told me that they have to give an estimate of how much product they think they will be shipping around the holidays way back in July. Wow, that must be difficult! They are also quite restricted by how much they can move by the fact that there are only three major package delivery companies in the United States – Fed Ex, UPS, and the US Postal Service. There are a few regional carriers on the west coast, she said, but other wise, nothing. Hum….I see an opening there for someone with a lot of money to fill a gap, but who knows if that will happen. As for the problem parts of my trips, here they are. I only had one hour layovers in Dallas both ways. That was not enough time, given that they weren’t feeding us on the plane. I managed to get food but it was a bit of a scramble to get on the tram from one terminal to the other, find my gate, get food, and get back to the gate. If my plane had been late getting into Dallas, I would have been in trouble, both getting to my flight and getting food. On the way home, our flight left Dallas at 7:30 pm local time. They acted as if we were leaving at midnight and kept the lights off for most of the two hour flight. It made no sense. If there is anything worse than being stuck in a plane for two hours it was being stuck in a dark plane for two hours. Really, it was not bed time. It was all my fault, but I left the book I planned on reading in my suitcase and didn’t have enough reading material on the second, longer leg home. I will not do that again! I read every word in my magazine, the airline magazine, and even spent time looking at the Spanish language airline magazine. FYI, I don’t speak Spanish. The pilot banged that plane down when we reached Ontario airport, on the last leg of my trip. I mean BANGED it down. My colon was somewhere near my throat after that. I think that was about as hard a landing as I have ever experienced. Whew! I am very glad the up in the air portion went more smoothly. Happily, on my most recent trip, the problems weren’t huge. Now, where to go next? Hubby, Youngest Daughter and I were in Kmart recently (because we really know how to party on a Saturday night!). It seemed like it was retro 1970s night there as they played song after song Hubby and I didn’t want to remember from our youth. Finally, as we were checking out, they started playing “Play that Funky Music (White Boy)” by Wild Cherry. We just shook our heads. Then we saw a group of young Latina teenagers leaving the store at the same time we were. They went into the parking lot, belting out the chorus. “Play that funky music white boy, play that funky music right…..” Hubby, Youngest and I agreed, if we were going to pick a song that transcended cultures and generations, somehow “Play that Funky Music” wouldn’t have been it. The weather was beautiful yesterday. The rain had washed everything clean and the rain also made everything green. It was so nice, the general manager at the parks district told me he sent some employees out to get photos of some of our parks, as they were definitely looking their best after all the rain. I also saw a great big tree in a nearby yard completely covered in white blossoms. It was gorgeous, even more gorgeous because I won’t have to clean up after it when all those flower petals fall…. The room where the computer resides is on the front of the house with a window that looks out on the front yard and street. It has a window seat that the cats think is a perfect place to lay and watch birds. I was at the computer when I heard Lumos growling, then he jumped up and ran to the garage, with Nox right behind him. Hum…I decided I better check out what was going on, as I never heard Lumos growl like that before. I looked out the window and saw a UPS driver coming up the walk to deliver a package. I appreciate Lumos taking over the growling at strangers job from Honey the dog. Good to know I can count on a pet letting me know when things are not quite right! Speaking of Honey, little puffs of her fur keep showing up here and there. We will never forget her, but it would be impossible to do anyway because of those little reminders. No matter what, we have a feeling we will always have Honey fur around. Hair production and shedding were her specialties! As I was preparing to go to Tennessee to visit family, I scanned some old family photos on the computer to take to my cousin and my mother’s cousin. 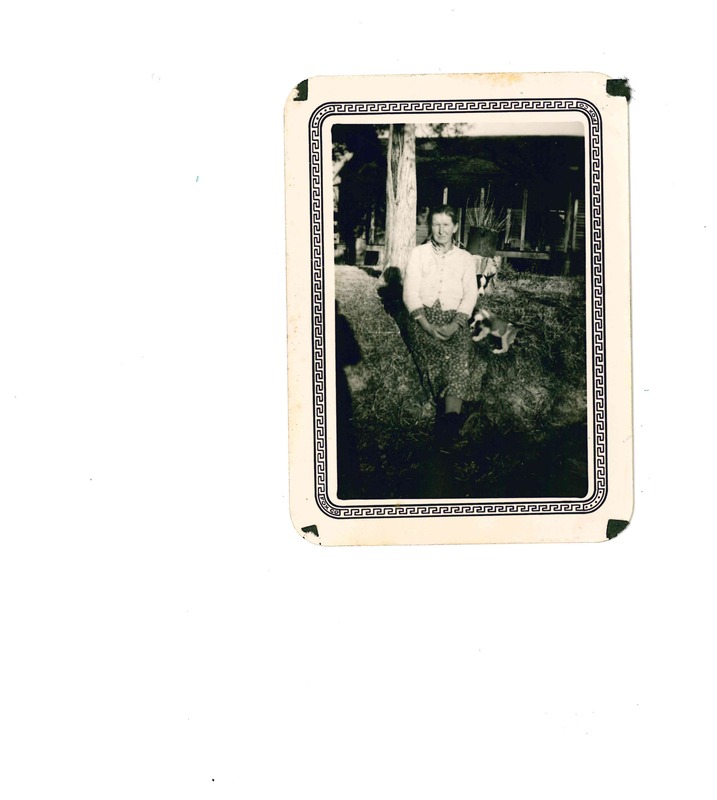 I looked at the old black and white and sepia toned photos of my mother’s parents more than I had in a very long time. It suddenly dawned on me that I didn’t know what color hair my mother’s parents had. They died long before I was born and it just never came up in conversation with my mother. My mother’s generation didn’t talk about those kinds of things very much, family things. So, for all these years, as I looked at old black and white and sepia toned photos, I just assumed their hair was brown. 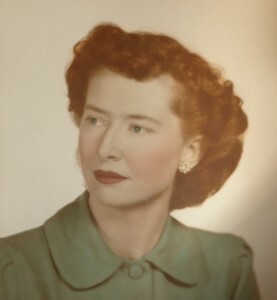 This is a black and white photo that was hand tinted, like they did back in the day, but I think it gives a fairly good representation of my mother’s hair color. Mom had to get that red hair from somewhere. Could it have come from one of her parents? How would I know? But on my trip my cousin and I had a lovely visit with our moms’ cousin. She knew my grandparents personally. They were her Aunt Mary and Uncle Dan. So I asked. She told me her Uncle Dan always had salt and pepper hair for as long as she could remember. But Aunt Mary had red hair, Dark red hair. Oh my! I could have cried! My grandmother had red hair, just like my Mom! I have no idea why that never came up, when Mom and I discussed her parents. You would think it would have. Maybe it did and I just don’t remember. Whatever the case, I now know. 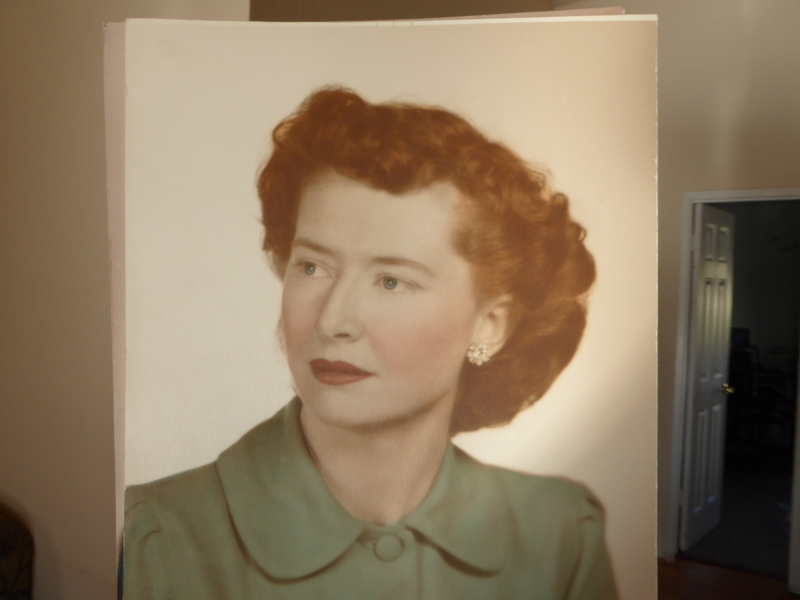 My grandmother had red hair. 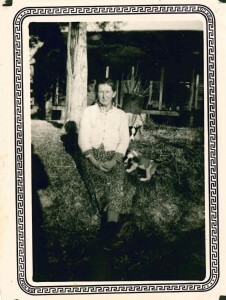 My red headed Arkansas grandmother.